It's Nayanthara's most awaited flick. It also stars Atharvaa,not to mention Anurag Kashyap who acting must be interesting to watch. 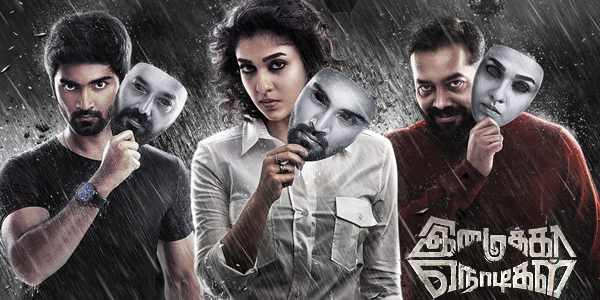 The trailer signaled a cat and mouse serious game between Nayanthara(the lead) and Anurag(the antagonist). Composer Aadhi has already showed his mettle in scoring for a similar theme in Jayam Ravi’s ‘Thani Oruvan’. This reminds of a recurring motif in Aadhi’s songs. With sharp nadaswaram portions and a fun background helping the track score an ‘enjoyable’ flavour as well, ‘Kadhalikathey’ might well become the next thing which youngsters are addicted to. Needless to say, the lyrics in the song have an equally important space that diverts us from an otherwise normal track. Vilambara Idaiveli doesn’t take itself seriously until some time passes. However,w hen it begins, it is at once impressive and gets you into its loop. There’s a light buzzing of electronic guitars contrasted by piercing nadaswaram which might have been used subtly. Srinisha’s rendition gels along much well with the male lead as well. Easily a good selection to be in your playlist. No doubt, you’ll get hooked onto the song’s initial flute prelude. Kabilan is in his elements as he has penned simple,soulful and meaningful lines that add life to the track. There is also a little electronic play succeeded by a sweetly poisonous violin portion as well. With an unhurried pace and beat pattern, Neeyum Naanum Anbe comes as a ‘repeat hearing mandatory’ track. A slow,melodious start. One can imagine a forlorn lover singing in a lonely house as he plays the piano thinking about his love. The track picks up elements as it moves forward, with vocal wavering that might not go well with some listeners. This track is not especially a very ‘powerful’ composition in terms of music, but it packs much emotion. You might grow on this song after several hearings. Lion vs Hyenas will get to you, with its sinister quality and narrative impact. It’s not a ‘song’ like you would’ve expected. It’s more of a story that fortunately comes with a very comparative analogy with respect to the film’s storyline, we guess. Even if it lacks the feel of a ‘music track’, one could not ignore the fact how the background music by Aadhi elevates the seriousness of the narration. Good track indeed! Slow violins, thumping beats take predominance in this track. The violins also become a little playful in the middle while the harsh background grows without restraint like grape vines entwined. 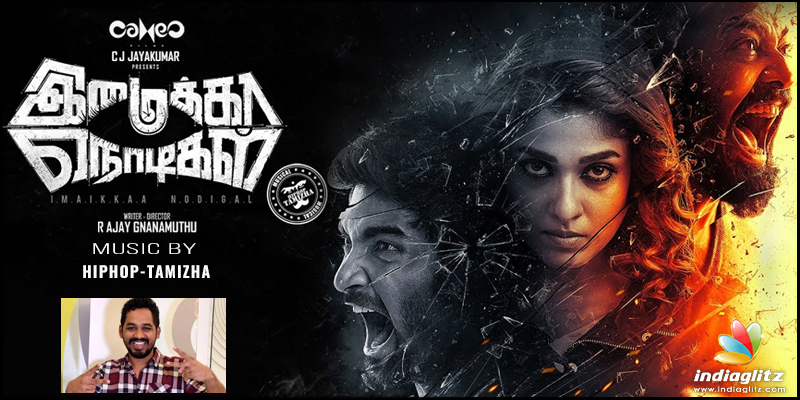 There are abrupt howls, electric guitar reams etc- Aadhi has pulled everything that might add ‘danger’ to the track. And pretty succeeded in it as well. Would be interesting to hear this along visuals on the big screen. Verdict: Hiphop Aadhi's album,though falls short of fan expectation has the potential to become liked over time of repeat hearings.